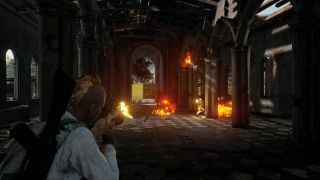 The mobile version of PlayerUnknown’s Battlegrounds (PUBG) can now be played on your PC thanks to an official emulator released by developer Tencent. The new Tencent Gaming Buddy emulator lets you enjoy the free game on your PC while getting the benefit of the mouse and keyboard for controls, rather than using a touchscreen on your mobile device. Doubtless one of the big drives for Tencent making this move is that there has been some controversy of late regarding some players of the mobile game who are already using Android emulators to allow them to employ the mouse and keyboard, and run rings around those playing with touch. By giving folks an official emulator, which will hopefully be a high-quality affair, the dev is providing a dedicated arena for mousers, and those using the Tencent Gaming Buddy will only be matched up against other such players – and not touchscreen users – to keep the playing field level. That’s the theory, anyway. Bear in mind that Tencent’s emulator is still in beta, and Android Police, the site which spotted this development and has given the game a whirl, says the implementation is still rather rough around the edges. That’s in terms of presentation – there are some interface issues – and performance, as the framerate isn’t so smooth. Naturally, we can expect the offering to become more polished in time, as the developer continues to work on it. This definitely seems like a sound move with the mobile spin of PUBG, and may even tempt more folks to try it, if they can bag it for free on their PC. But as mentioned, the big hope is that people will switch to this official solution to get their mouse and keyboard shooter thrills, rather than using an Android emulator to effectively ‘cheat’ against those using the more clunky touch controls. Sadly, part of the thrill may be the fact that some players love the advantage they currently have in the mobile app when using mouse and keyboard controls. Those sort of folks are just going to look at this new emulator, shrug their shoulders, and ask where’s the fun in that? Incidentally, if you’ve not played PUBG on mobile before, you can read up about it in our article.